Where I live, we're lucky to enjoy local strawberries year-round, but they're never as delicious as they are right now. The all-too-brief blueberry season is upon us, and the raspberries are heavenly. We're gobbling up berries as-is, adding them to cereal, spooning them over French toast, scooping them atop ice cream and yogurt, canning them for a rainy day ... we can't get enough. 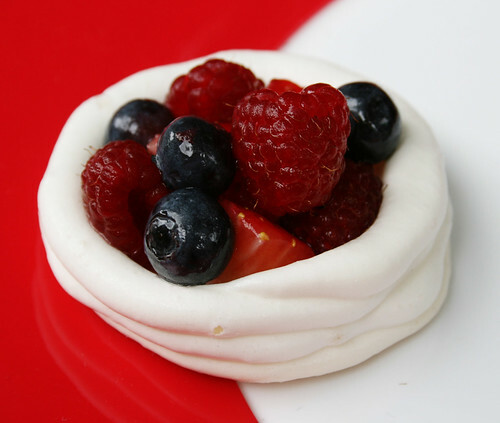 The light meringues, with a delicate hint of rose, are a perfect pairing for ripe berries. To take it up another notch, stir some chopped mint into the berries. I loved a bit of chocolate mint, but somehow the green flecks screamed "healthy greens!" to the son who eats berries like they're candy and munches mint leaves straight off the plant — he refused to even try it. Instead of rosewater, you can use a smaller amount of vanilla or almond extract, or substitute orange blossom water. These are fun at a picnic — cushion meringues well with waxed paper and pack the berries separately. This makes 16 to 24 meringues, depending on how large you make them. Preheat oven to 250 F. In a very clean mixer bowl fitted with a whisk attachment, beat egg whites until foamy. Add 3/4 cup sugar, rosewater, and cream of tartar and continue beating until meringue is glossy and forms stiff peaks. To check that it's done, rub a pinch of meringue between two fingers -- if it feels grainy, keep beating. 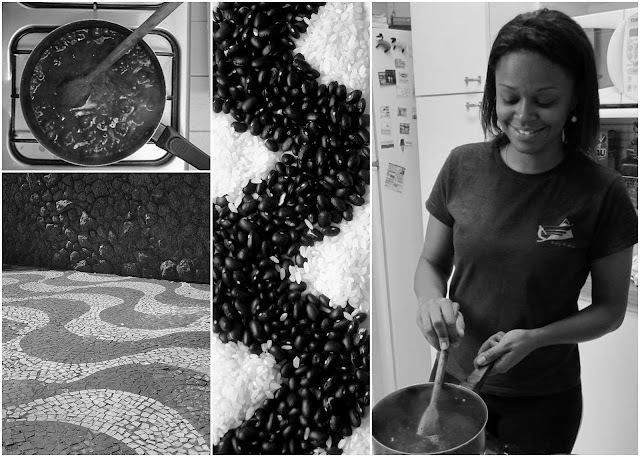 Bake for an hour and a half to two hours, rotating the baking sheet every 30 minutes to ensure even baking. Meringues are done when they are crisp to the touch. If they start to brown, turn the oven temperature down by 25 degrees. Cool completely on a wire rack and store in an airtight container. Meanwhile, combine assorted berries (leave small berries whole, but chop up strawberries) with 1 tablespoon of sugar in a small bowl. Stir well and let sit for at least an hour so berries macerate and release some juice. 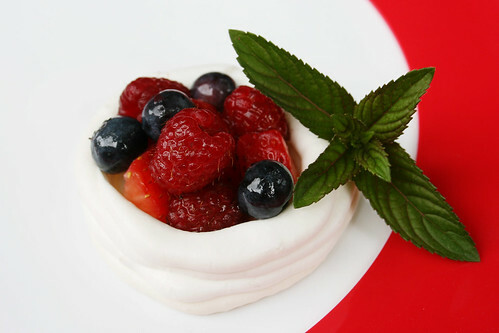 To serve, spoon berries into cooled meringues.